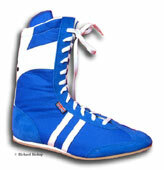 Boxing Boots have been hand made by Richard Bishop for three decades, during which time his company RB Footwear has specifically designed custom boots for famous world title fights. 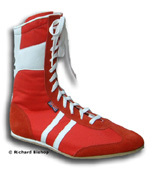 Customers of RB Footwear include Lennox Lewis click here >>Frank Bruno, Mohammed Ali, Audley Harrison, Dave 'Boy' Green, Nigel Benn, Charlie Magri, Joe Bugner, Alan Minter, Lloyd Honeygan and John 'H' Stacy but to name a few. 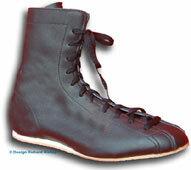 This is the company that manufactured for just about every big brand name in the industry. 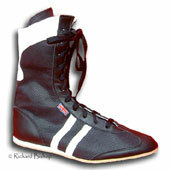 Your British made boots will be hand made by Richard himself who makes for world champions boots which are now available direct from his factory with no middleman markup. 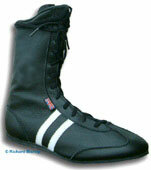 Quality is what brings the big names back time after time, quality is what this company has been built on! 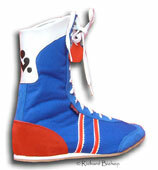 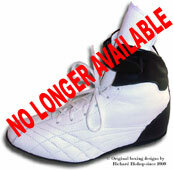 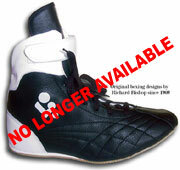 Special edition boxing boots can now be brought direct from the factory. 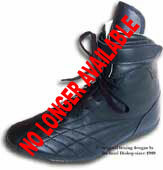 Click on any boot to see more detail or to purchase.